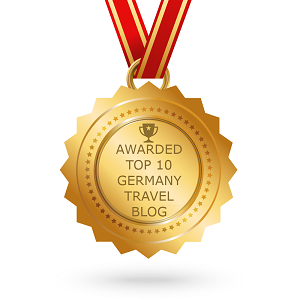 If you are traveling to Slovenia and you like to be active, you came to the right place. 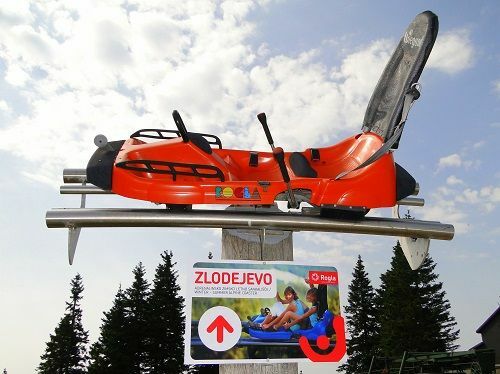 Slovenia is great destination for all kind of outdoor activities, including extreme. But don’t worry; even if you are not into extreme sport and you only enjoy easy hiking, there is lot to choose from. 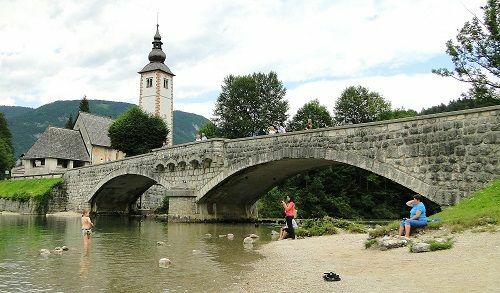 Even though Slovenia is a very small country, we, Slovenians, feel a little blesed to live here. There are numerous possibilities to do some kind of outdoor activity and one of widely spread is hiking. Julian Alps are probably the most known among foreigners, but we have other mountain ranges as well. No matter which one you choose, there are always good places for hiking in Slovenia. Traveling, where just standard city tours are being offered, is long gone, so when traveling to Slovenia, you should not miss visiting our mountains. We have collected four different hiking tours in Slovenia, which are good for everyone, including families with small children. 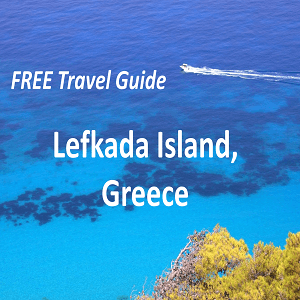 Each hiking tour will show you diversity in our landscape and will offer you a sneak peek into our lives. Planica is best known for ski jumping, as each year a World Cup competition is held here. Slovenians are super proud on Planica and their jumpers, being one of the best in the world. No wonder more thousands are pouring to Planica when the competition in ski jumping is held – it feels like a national holiday during those days. Planica had the biggest jumping hill in the world once and even now, the views are stunning! 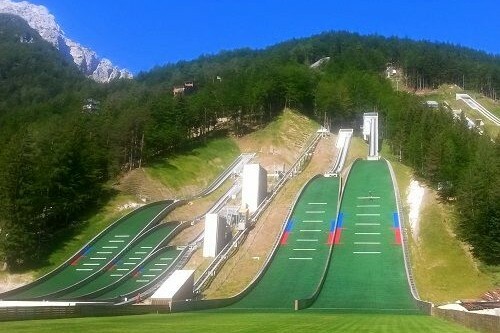 If you’re brave enough and in a good shape, you can walk all the way up to the jumping hill and you’ll see you need a lot of courage for a ski jump. Respect to all ski jumpers in the world! Continue your trip from Planica on a beautiful hiking trail, which leads to Tamar – a valley in Julian Alps. Tamar is perfect for ice climbing in the winter due to its many icefalls. In the summer time Tamar is great for hiking. 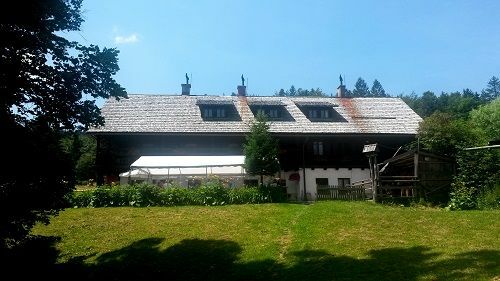 To reach the mountain cottage in Tamar from Planica, you will need about 50 minutes by food. 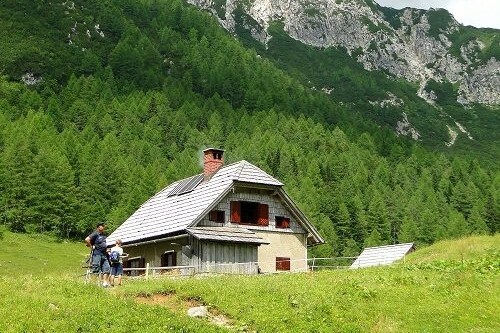 In between you will be enjoying stunning views on Slovenian mountain peaks. 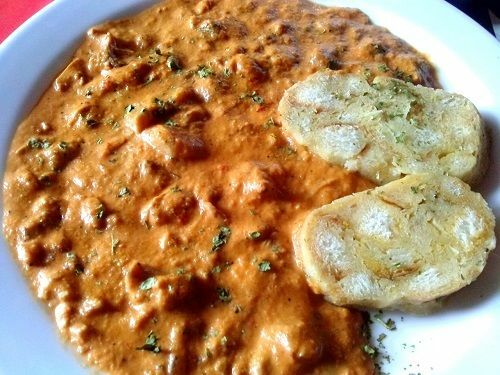 If you’re there for lunch, try some traditional homemade stews (jota, ješprenj, obara) or go for cheese rolled dumplings »štruklji«. You will not regret it! Tamar is also a great starting point for more challenging hiking, but make sure you have the right equipment to do them. Pokljuka is a mountain plateau in Triglav national park, but most of the people (sport enthusiasts) know it for its biathlon center. There are numerous cross-country options available in the winter time, but during hot summer days, people mostly visit it for hiking. 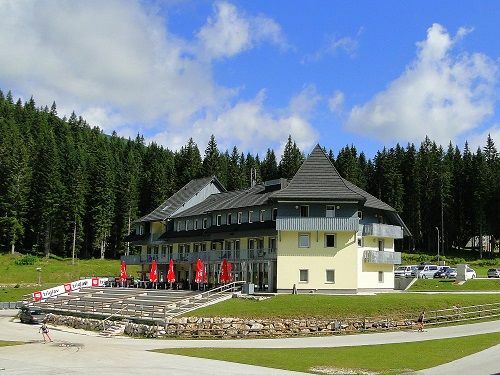 Start your hike at the biathlon center and follow the marking path towards »Uskovniška koča«. The hike will take about 45 minutes and is good for everyone, also children. 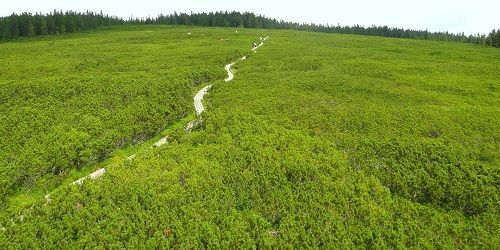 If you’re up to for a longer hike, choose a path to Konjščica – kids will love it due to picking up blueberries and see lots of anthills. 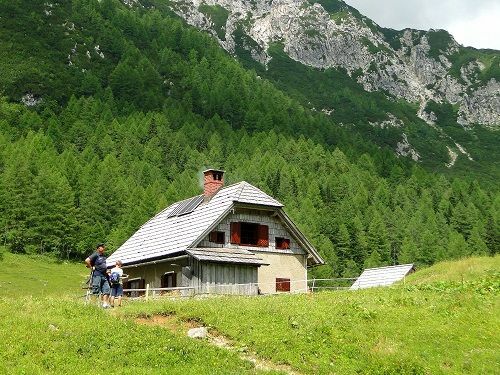 You will need an hour and a half to reach the mountain cottage at 1442 meters of altitude. Before heading back, treat yourself with a quick lunch. Go for the homemade sour milk –very typical for our mountain cottages. The sour milk goes great with »žganci«. Žganci are similar to polenta, but prepared with finer grains. 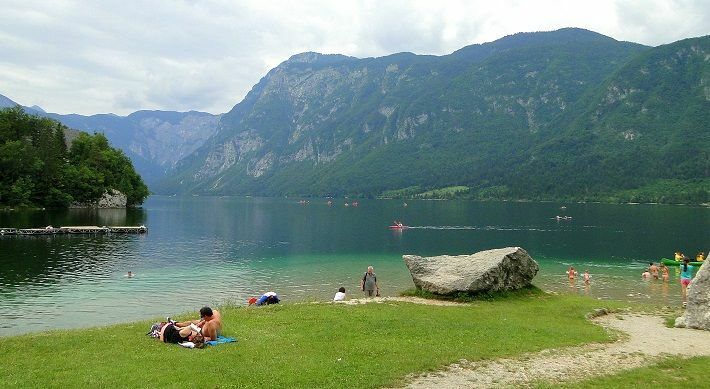 Before ending a perfect hiking day, visit Bohinj and its lake. Its water is cold, but very refreshing to swim in after the hike. Rogla is less visited even with Slovenians, but that does not mean you should skip it too. Due to less popularity, it is even more charming and untouched. 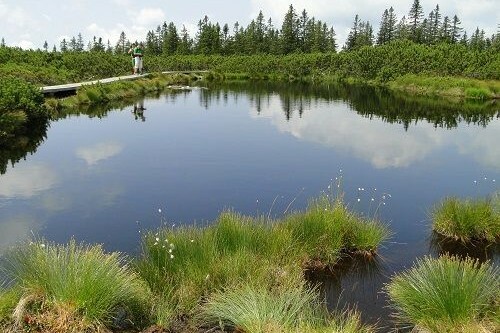 Winter in Rogla offers good skiing, but summer time is mostly visited for hiking. 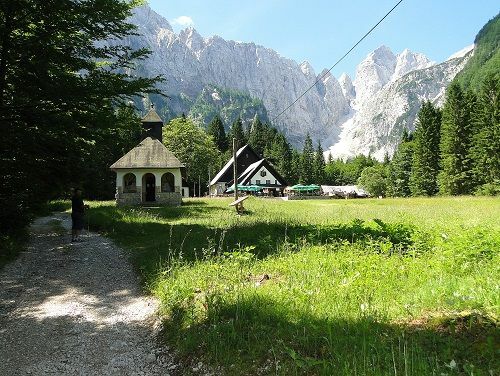 Start your hike at the Church of Jesus Christ, which symbolize the local life. 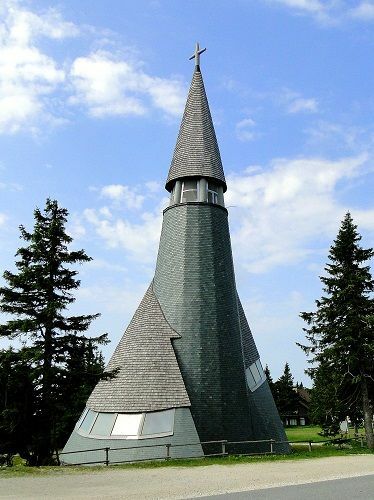 The church has three bells, honoring three saints: St. Peter (patron saint of blacksmiths), St. Roch (patron saint of peasants and herdsmen) and St. Barbara (patron saint of miners). 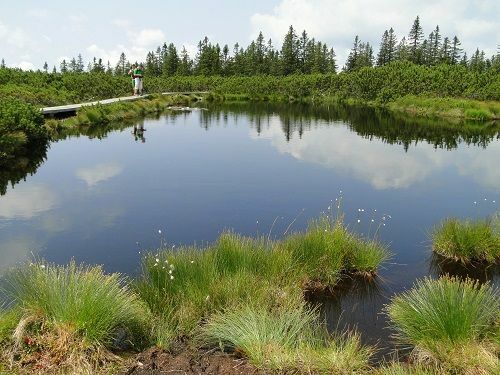 There are numerous hiking trails at Rogla, but we would recommend you to go to Lovrence lakes. The hike will be about our and a half long, but it is well worth it. The hiking trail runs through forest and is in shades most of the way. Reaching the moor with lots of pine trees and lakes will blown you away due to its unique beauty. The moor has numerous lakes, which you can reach on a footbridge. Some lakes even include water lilies. The walk is stunning and the landscape is one of a kind. To really get the feel of the moor, climb up to the viewing tower in the middle of the moor. Spectacular! After the hike you might feel hungry and in this case, visit Planja pizzeria. You can go for pizza, but if you want to taste some of the Slovenian cuisine, order delicious porcino soup and štruklji (cheese rolled dumplings). 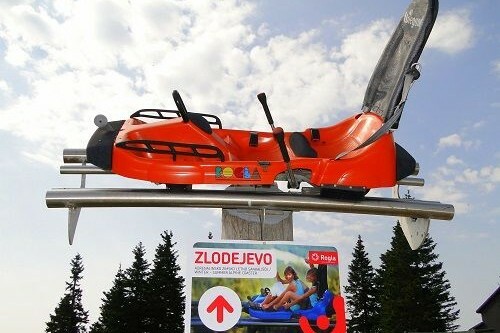 There are numerous ways to reach Vodiška Mountain. You can hike, drive by car or cycle up there. The choice is yours. 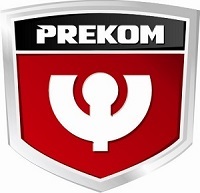 If you’ll be traveling around Slovenia by car (the best option to reach remote places) leave the highway at the exit Radovljica and drive towards Kamna Gorica / Kropa. When reaching a small town of Spodnja Lipnica, turn towards Vodiška Planina and follow the marking for Vodice / Partizanski Dom Vodiška Planina. When the asphalt road ends, you will have a solid 15 kilometers of tarmac road ahead of you, which runs through the forest. The same road is also a cycling path. 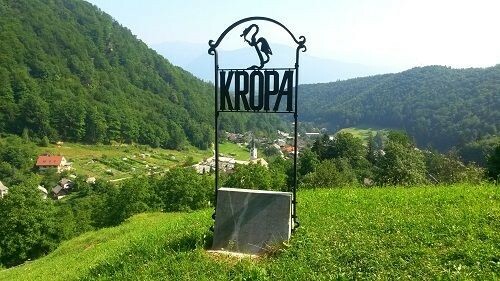 If you would rather hike to Vodiška Mountain, you need to reach town Kropa. 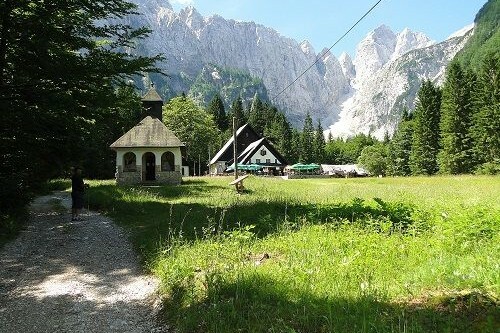 Look for the St. Lenart Church and follow the marked hiking trail. The hike will take about an hour and a half. If you feel like eating a homemade food, typical for Slovenia, you came to the right place. 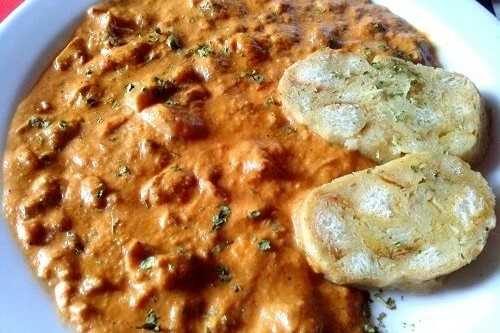 If there’s a porcino season, make sure to try their delicious porcino goulash (yummy!!). For a dessert order štruklji (yes, we love them). These ones are very special, as one portion includes 5 of them, each with different fillings (cheese, blueberry, mixed forest fruit, raspberry, banana and walnuts). On a sunny day forget about the time and relax under more than 500 years old lime tree. That’s life! 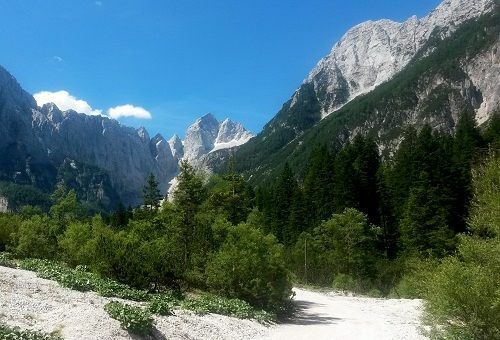 Hiking in Slovenia is some kind of national sport, so if you really want to feel the vibe and meet the locals, you should definitely do a hike or two. 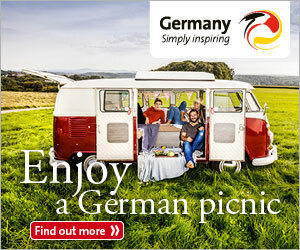 After all, the best places are always a little bit hiden and hard to reach! How does age influence your traveling?